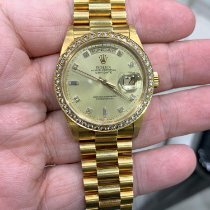 This is a very rare Rolex CROWN Collection watch from the mid to late 1990s. It is double quickset. The diamond bezel is Rolex Factory original with 3 ctw of asher cut diamonds. The dial is Factory original lapis serti with factory diamonds. The band is the Factory rare 76b oyster band made only for a short time and not offered in all markets. The end pieces are similar to the normal president band as they are solid gold.